AUTHOR: Alison Freeman, Senior Consultant. When it comes to making a difference, we all want to know our own organisation is on track. So why is it so difficult for organisations to get to grips with measuring their social impact? I was discussing this challenge with a senior manager during one of our bespoke impact measurement courses. Like many of our clients, she wanted to know the secret to embedding an “impact mindset” across her organisation. This had been triggered by a recent staff survey that had shown impact was as important to an individual’s wellbeing as pay and flexibility. She had already secured buy-in from the top, a critical first step. Championing impact measurement when you aren’t the final decision maker can be like playing snakes and ladders – one minute you step up a few rungs of the ladder, but then a new strategy or structure imposed from above will see you slide back down. I suggested to her that the best way to tackle this is to form a working group that represents and communicates with the whole organisation. Locate your learning and development experts, managers or champions. All organisations support learning and development in some fashion. You may have a specialist team, or the skills may be within your HR function. Meet with that team, or person, and discuss the learning need for impact measurement. If learning and development is devolved to teams and line managers, or dispersed geographically, you may need to form a working group to plan how an impact learning programme can be initiated. Internal or external? Decide if rolling out the training is a job for someone inside or outside the organisation. The advantages of using an external trainer include access to specialist knowledge and experience in impact measurement. An external trainer will be able to listen and advise teams neutrally on how to put impact measurement into practice and can bring broader ideas and energy into the mix. You may prefer to design a learning initiative that can be led internally by people who know your organisation intimately, its strengths and its sticky bits. If cash is a more important resource than time this could be the option for you. The third option is to use the best of both worlds. Run a ‘train the trainer’ session and co-produce the internal learning programme with external advice. From training to learning – consider all the ways people learn. 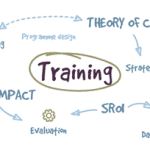 When designing your learning initiative don’t get hung up on training programmes. More than ever, today’s students are learning on their feet and taking advantage of a multi-media environment. Ask yourself, how do people in my team learn best? Do they like to read books or interact? Do they enjoy developing theories or trying out new concepts in practice? Consider options such as online courses, shadowing more experienced impact practitioners, mentoring, action learning groups, secondments, simulations or reading seminars. The solution should fit your own context but try mixing up the methods so there is something for every learning style. Make it personal: the ‘what’s in it for me?’ factor. To make your investment in learning deliver, participants need to see how the impact course is going to improve their job. As a trainer, my heart sinks every time I hear someone say: “I’m here because my boss sent me”. To take something meaningful away, participants must recognise their learning needs. They should be given options or principles they can explore by applying them to their own situations. People usually see time they are given for learning and development as a reward or bonus. However, the value to the organisation is just as great – it is critical to ensuring that the talent across the organisation remains relevant and effective. This is an investment that will just keep on giving. When it comes to strategic decision making, impact literate staff will use laser sharp precision in enabling your organisation to create social value. Alison is a key provider of NEF Consulting’s organisational culture and wellbeing programmes. She is a skilled learning and development practitioner. Her trademark is designing courses that grow both participant’s technical ability in evaluation as well as their personal leadership. Alison has taught and designed education programmes at scales of one-to-one to over 300 participants. She is currently delivering both bespoke training and courses in our open training programme on measuring both social impact and wellbeing. For more information and contact details click here.